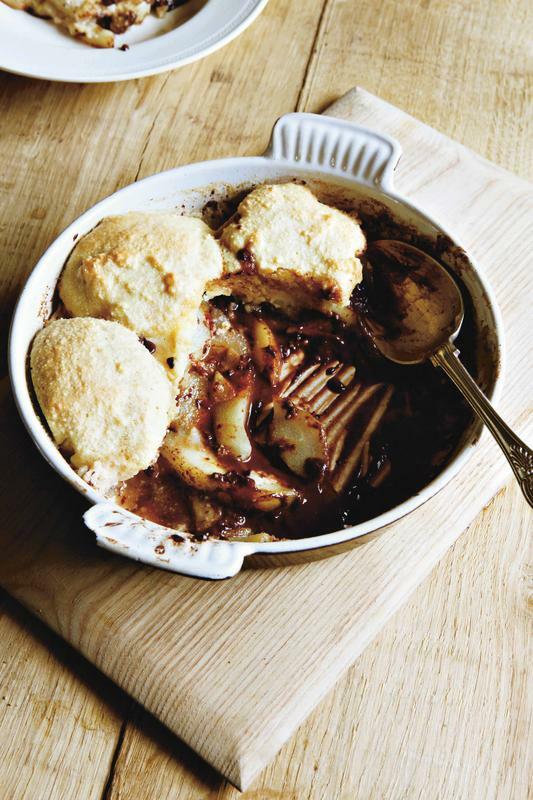 The natural sweetness of pears balances beautifully with bittersweet dark chocolate and a crusty, cobblery topping in this baked pud. It's luxurious without being heavy. Have ready an oven dish, about 1.5 litre capacity. Peel the pears, quarter them and remove their cores. Cut each quarter into 3 or 4 slices, dropping them into the oven dish as you work. Spread them into a roughly equal layer. Trickle the apple or pear juice all over the pears, followed by the honey. Finally break the chocolate into small pieces and distribute evenly over the fruit. Sift the ground almonds, rice flour, baking powder and sugar into a bowl (or mix thoroughly with a whisk to disperse any little lumps). Add the eggs and rapeseed oil and beat together thoroughly until you have a thick batter. Drop the batter in 6 large dollops around the edge of the dish, partially covering the pears. Bake for 35-40 minutes or until the cobbler topping is firm and golden brown. You can poke a skewer into the topping to make sure it's cooked through - it should come out clean. Leave the cobbler to settle for 10 minutes or so, then serve. (You may find the chocolate has gone a bit grainy where it's mixed with the hot pear juices, but this will in no way detract from the all-round deliciousness of the pud! ).